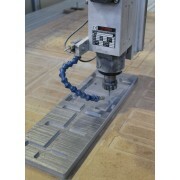 High Quality Benchtop CNC Milling Machine Ideal CNC mchine for Milling, Rapid Prototyping, Engraving and Routing. 3 - Axis Clamping Area: 1330 x 680 mm This economic machine is ideal to make master models, patterns and plugs with our wide range of PU, Epoxy, Polyester Casting..
CR157 - CH157 Clear Casting Epoxy This system is ideal to cast clear Decorative and Promotion objects. Excelent UV resistance Slow curing - Low shrinkage - No air bubbles Ideal to cast LED Assemblies as well Hard and tough - Slightly flexible ..
LR153 - LH153 Flexible Potting Resin Potting Resin for LEDs and Solar Panel Arrays Clear No Air Bubbles Good UV Resistance ..
Material A1 is an acrylic based organic composite consisting of a mineral filler and a water based acrylic resin. It has been formulated to give the following benefits: Good mechanic properties Excellent surface finish Excellent water resistance Excellent UV resistance ..